Founded in 1859, Golden attracted many people seeking freedom, prosperity, and the adventure of the Wild West. However, due to tragedy, violence and disease, many have had to make one of Golden’s historic cemeteries their eternal resting place. Before Golden built its cemetery in 1873, many of those who died were buried on a hill north of downtown Golden. Due to violence and exciting endeavors, some historic residents were said to have “died with their boots on” – implying that they had a violent or sudden death, in the heat of action. Many of these prematurely deceased rested at a small ridge just north of downtown, which can be called “Boot Hill.” Those buried on Golden’s Boot Hill include veterans of the Civil War and the Mexican-American War and workers caught in the White Ash Mine Disaster of 1889. These war heroes lay alongside members of the notorious Musgrove gang, famous for stealing horses and mules. In 1868, detectives from Denver engaged in a gun fight with gang members while they were plotting to rescue their leader, Lee Musgrove, from a Denver jail. Victims include “Heartless” Edward Franklin and an innocent bartender working at the Overland Hotel. The Golden Cemetery was founded in 1873 when Golden became a more established city. Cowboy, actor, and one of Golden’s most famous public figures, Pete Morrison, can be found at Golden Cemetery. Morrison rests alongside many gun-toting sheriffs such as Joseph Dennis, Walter Pollard, and Clarence Hoyt. Want to learn more about Golden’s history through the tales of past residents and get a chance to “interview” notable historic figures? 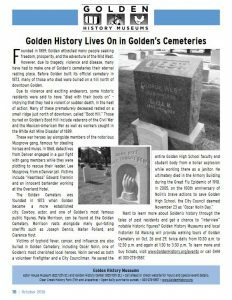 Golden History Museums and local historian Ed Weising will provide walking tours of Golden Cemetery on October 26 and 29, twice daily from 10:30-12:30 and 1:30-3:30. To learn more and buy tickets, visit GoldenHistory.org/events or call us at 303-278-3557. 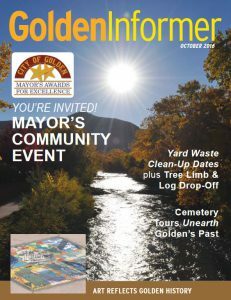 The preceding article appeared in the October 2016 issue of the Golden Informer.